Lifestyle creep, or lifestyle inflation, is the tendency we have to inflate our standard of living as our incomes increase. When we first graduate college and get a “real job,” we’re content to live in an apartment with a roommate, use Goodwill furniture, and drive a beater car. But as we bring in more money, we tend to upgrade our houses, furniture, and cars, and once we trade up for a nicer model, it’s really difficult to downgrade again. If you’re interested in financial independence or early retirement, however, minding the gap and saving as much as possible is critical. One way to save larger and larger chunks of money is to keep the same style of living, even while your income rises. Mr. ThreeYear and I are working toward doubling our net worth and becoming location independent in the next three years, so lifestyle creep is something we try to avoid. Do we live with roommates and eat ramen? Well, no and sometimes. But we do actively avoid lifestyle inflation. And we’ve determined the best way to avoid lifestyle creep largely because of our own mistakes. 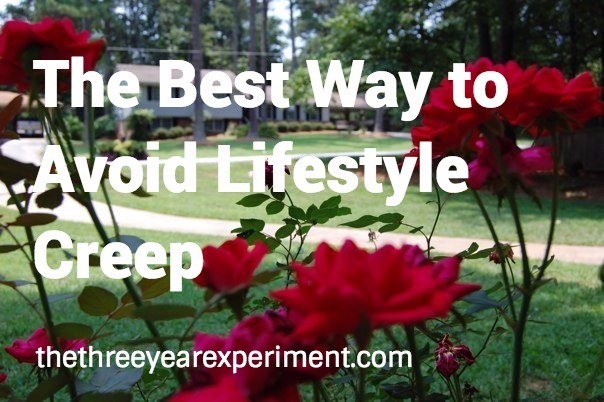 We’ve realized that the number one way to avoid lifestyle creep is to stay in the first house that you buy. Our biggest three expenses in our modern world tend to be housing, transportation, and food. And housing, especially in this country, can eat up an astronomical percentage of your take home pay, if you let it. For many Americans, the typical progression is this: we graduate college, get a job, and find an apartment (often with a roommate). Then, after a few years, we save up a downpayment and buy a “starter home.” At this point, we may or may not have married, and may or may not have kids. Once we have a few kiddos, we live in our starter home for a few years, then decide that the school district where we bought said starter home is undesirable, so we buy a more expensive (and usually bigger) home in a better school district. With that bigger home comes more expectations for spending, like nicer cars, higher end patio furniture, yard services and housekeepers. Then, perhaps when the kids are a bit older, we’ll move again, to our “forever home,” one that’s even bigger and has some of the perks we couldn’t afford with our second home, like a built in bar in the basement and a three car garage. Or, instead, we might buy a second home in a vacation area we’ve visited for several years, because it’s a “good investment” (but ends up costing way more money than it generates). You get the idea. What if, instead, we treated our starter home as our forever home? I know, I know. They’re usually older, and smaller, and not in the most desirable school districts. But often, they’ll work fine for our needs, and many of our reasons for moving can be worked around. Kids can go to magnet schools, we can learn to live with a bit less space or put guests on air mattresses when they come to visit, etc. This has been a strategy for several financially independent bloggers including Justin at Root of Good and Paula from Afford Anything. They know that keeping housing costs low is THE best way to avoid lifestyle creep. Mr. ThreeYear and I followed a “typically American” progression with houses. When we first got jobs in Atlanta, we lived in an affordable, spacious 1100-square-foot apartment in Atlanta. It was a bike-able distance to Mr. ThreeYear’s job (unheard of in Atlanta) and had tennis courts and a nice pool. But, Mr. ThreeYear and I decided it was a “shady” neighborhood and that we needed to own a home of our own. So, we ponied up a massive 5% downpayment (har har) and bought an older starter home in a neighborhood in a suburb of the city. This was in 2006, at the height of the housing bubble. Luckily, we bought way less house than we qualified for, and it was roughly the same as our rent cost. However, there are many more costs involved in home ownership, which we learned as the years passed. We did not avoid lifestyle creep with this home purchase–in fact, we bought our first house knowing we’d probably move when our children became school-aged, because of the terrible elementary school in the area. 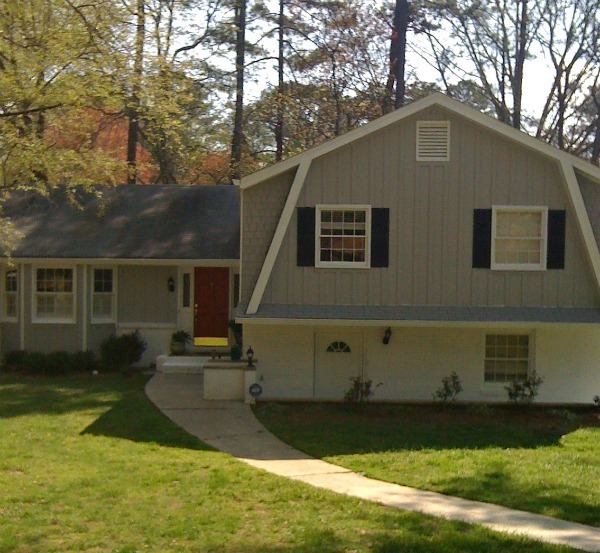 Our “starter home” in Atlanta. When we moved to New Hampshire in 2010, we sold our starter home for about $30,000 less than we paid for it, and rented for several years. If we’d stayed in the same apartment in Atlanta for the time we’d lived in the city, we’d have been much better off financially. Yes, our rent did increase precipitously during our time there, but we wouldn’t have lost our downpayment and all the money we put into our starter home for upgrades. And we’d have spent way less time commuting, so our lifestyle could have been more relaxed. Our next door neighbors in our starter home neighborhood, Faye and Fred, had lived in their modest ranch home for their entire married lives. They told us they paid more for their new car in 2007 than they had for the house, which they bought in 1963 for around $32,000. They could certainly have afforded a bigger and nicer house. Fred was an engineer who’d graduated from Georgia Tech and had a good job just down the road at Lockheed for many years. Staying in the same house was a contrarian decision–trading up McMansions is practically a local sport in Atlanta, after all. But imagine how much money these millionaires next door saved in all those years, just by living in their starter home, which at one time was their dream home. Their children (and then grandchildren) got to grow up and visit the same house, year after year. Faye’s garden had several beautiful trees she’d planted years ago that she could stare out her sliding glass doors at every day. And our neighborhood was a lovely walkable neighborhood, with mature trees and like-minded frugal neighbors, who valued location and community over bigger, newer houses. The lot sizes were enormous for Atlanta. Our own house, a corner lot, sat on a 3/4 acre plot of land, and it was filled with mature shade trees. In the spring, the azalea bushes were breathtaking. But Laurie, you might be thinking, how do I access the increase in my home’s value if I don’t sell it? Fair point. But I recommend not looking at your house as an investment, because it’s not. Historically, houses have provided less than 5% returns, with inflation. Even if your house has increased in value substantially since you bought it, chances are you’re moving to a nicer neighborhood in a similar place in the country, so you’ll be paying that inflated value for your next home, as well. Also, the transaction costs of buying and selling a home are astronomical. Let’s make a deal: we can cash out your investment fund now, so you can have access to it, and I’ll take over 10% of the profits as my cut. Then we’ll stick your investments back in your fund and let them keep growing. Sound ridiculous? That’s how selling a home and buying another one works. You’re surrendering a huge percentage of the value of your home to your realtor, bankers, appraisers, movers, and other professionals involved in the transaction. But you’d never make the same mistake with your retirement account, would you? When Mr. ThreeYear and I began to date in Chile, and we watched his relatives slowly buy houses in Santiago, I realized that there was a huge cultural difference between our two countries. In Chile, when you bought a home, you normally bought it for life. Mr. ThreeYear’s two older sisters both lived in the first houses they’d ever purchased. The thinking was, if you spend such a large amount of money on a purchase, you should keep it. And if we look at Chileans’ savings rates, as compared to Americans (take a look at this post by Mustard Seed Money for a chart), we see they save over 20%, compared to American’s paltry 3.5%. As Mr. ThreeYear and I have learned, because of the constantly shifting UF, which is a complicated financial instrument and tied to Chilean mortgages, Chileans’ mortgage rates tend to slowly increase over time and have prepayment penalties. So there’s even more incentive for Chileans to save up large down payments and live in the same home forever. Chileans know that to avoid lifestyle creep, and save more of your precious money, you buy a home and stay there. In this country, it’s almost frowned upon to own the same home forever. Faye and Fred, our neighbors, felt the need to apologize for their “small house.” A friend of mine who lives here in New Hampshire, and has also kept her starter home, says the same thing. But she has an only child, and her home has everything she needs. She invited a group of women over for a ladies’ night, and ten of us ate a full dinner in her kitchen. She’d set up two folding tables, we all ate in the space between the den and the kitchen, and it was perfect. We didn’t care. We were delighted to be invited over and have time together. When we finally bought our home here, it was nicer than our previous home, and we paid about $60,000 more for it than our previous home. However, we’d learned several lifestyle creep lessons and made the following decisions: we’d live in this home as long as we lived in New Hampshire. So far, that’s been five and a half years. Second, we’d make sure the house cost 25% or less of our take-home pay. That percentage has steadily decreased as our incomes have gone up. Finally, we took out a fifteen year mortgage on the house, and have been able to pay down a large chunk of equity in the house. 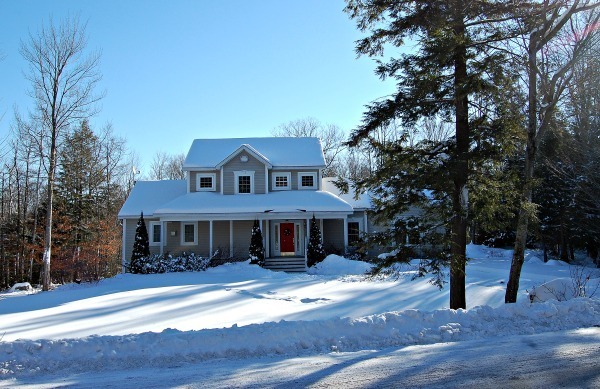 Our new house in New Hampshire. Larger and more expensive–cue lifestyle creep. The truth is, if you can discipline yourself to stay in one home for most of your adult life, you’ll be in a far better position to become financially independent sooner. Mr. ThreeYear and I have often fallen into the trap of looking at larger and more expensive homes in more desirable areas, but we quickly remind ourselves that keeping our housing costs low is a key strategy in our ability to quickly increase our net worth. We also talk about downsizing when we move, because we’ve realized that for our family of four, we don’t need or want quite so much space. So how about you? Have you lived in the same house for a while? Bought a new, more expensive house like us? Lance, that sounds like the golden FI recipe! I actually had a friend who did this for years. She bought a starter home in Savannah, GA (low cost of living city, high-paying job), lived with one or two roommates, and paid her mortgage way down over the course of the seven years she lived in the house. She eventually upgraded, but she was definitely #winning financially with that recipe. Man, we have had very similar stories re: housing. Earlier this year we moved from our perfectly fine, 1270 square foot starter house of seven years, to a bigger, updated home…which we love. But it’s definitely a huge ongoing cost that creates a riskier FI scenario (i.e. – one with a lot of extra debt), albeit with a lot more funds put into the market from the sale of the prior home. So true! 🙂 Hopefully those one-time costs will pass (they did with our bigger, pricier purchase). I do worry, if we move again, about “hidden” costs. My sister just moved and their water bill was astronomical. Part was due to a leak but I think part was due to the fact that water costs are higher in the newer part of the city where she moved. Thanks for visiting! Hey Laurie, cool article it is indeed very easy to fall in the lifestyle creep due to social pressure as well. Let´s say one got a raise or a promotion and you think hey I deserve more comfort, more space, better restaurants,… I can afford it after all. I think in the early stage of life that is what we all (or at least most of us) fall for. Since I have lived in several countries it is interesting to see how different countries manage their money, in Belgium for example people usually stick to their house for a long time as the chileans, while in Norway it is more common to switch houses. You’re so right about social pressure! We felt it very strongly in Atlanta, while here in New England it’s the opposite. It’s very interesting how cultures manage their money and houses. I wonder why it’s more common to switch houses in Norway? I know the cost of living and incomes are very high but I wonder if that has anything to do with it. Laurie, actually the market conditions makes it very easy to switch houses. For example in Belgium/France and Spain you need to pay 10-12% for admin costs (notaire+municipality) and the paperwork is heavy. In Norway if you want to sell your house today it can be done in less than a month and buying one is pretty quick as well once you found it, I am in my mid30´s and so far I still live in my first home but it is not uncommon for others around me to be in their 2nd or 3rd house already.